Confluence Park June 7, 2017. 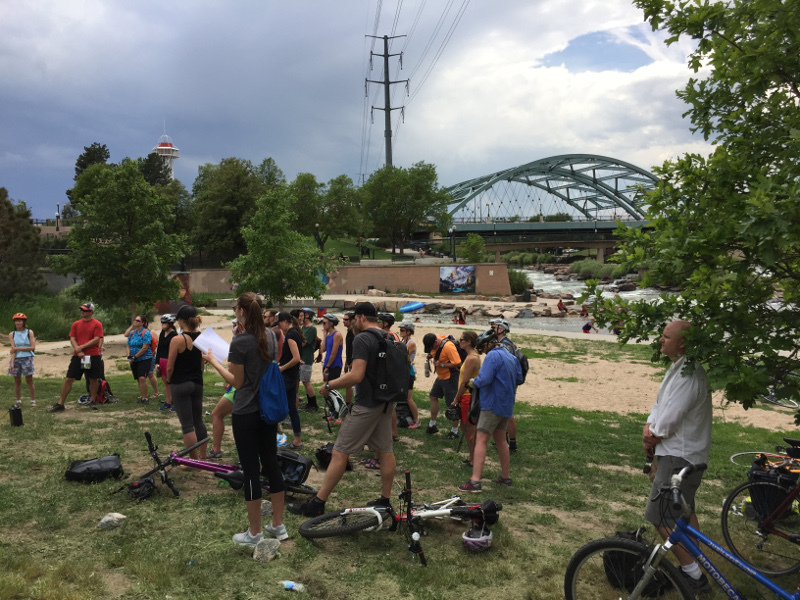 Colorado Foundation for Water Education Urban Waters Bike Tour. When we think about Colorado waterways, our minds often wander to the larger rivers that traverse the state, like the Arkansas, Rio Grande and Colorado Rivers. However, our smaller, local waterways also play a significant role in providing important ecosystem benefits, as well as water to communities and industries, and habitat areas for wildlife. Join the Barr Milton Watershed Association, Water Education Colorado, Metro Wastewater Reclamation District and the Colorado Stormwater Council for a fun and interactive day learning about the history of the Sand Creek Waterway and efforts to reclaim it. Explore this waterway by bicycle along with citizen leaders, scientists, planners and water managers. Register today – space is limited. Both the June 5 (morning) and June 6 (afternoon) bike tours are exactly the same. 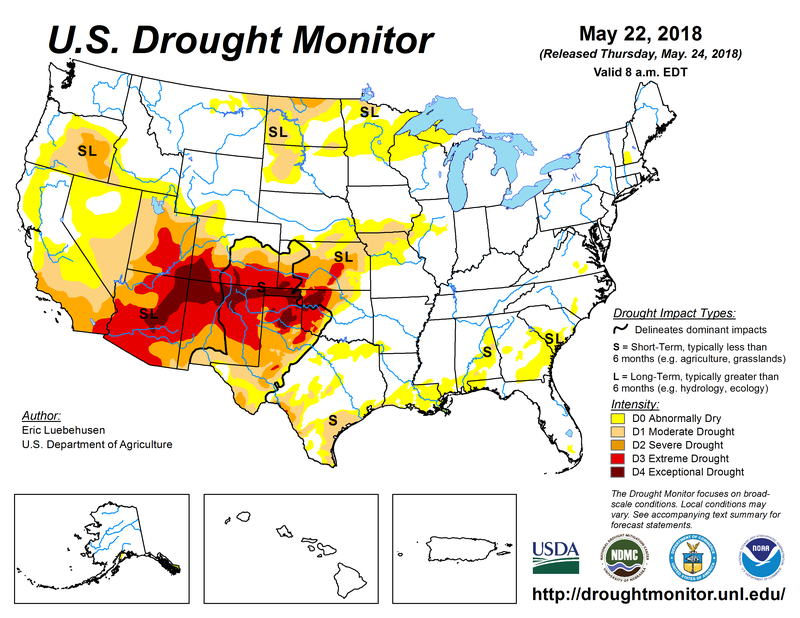 US Drought Monitor May 22, 2018. Sure, it’s late May, and normally by now the mountain snows have all but wrapped up for their annual three-month-or-so summer hiatus. But in a typical year, snowpack hangs around well into June, and sometimes even into July and August. In southern Colorado, there’s virtually no snow left, even on peaks, and further north, there’s barely a third of the snow you’d typically expect this time of year. 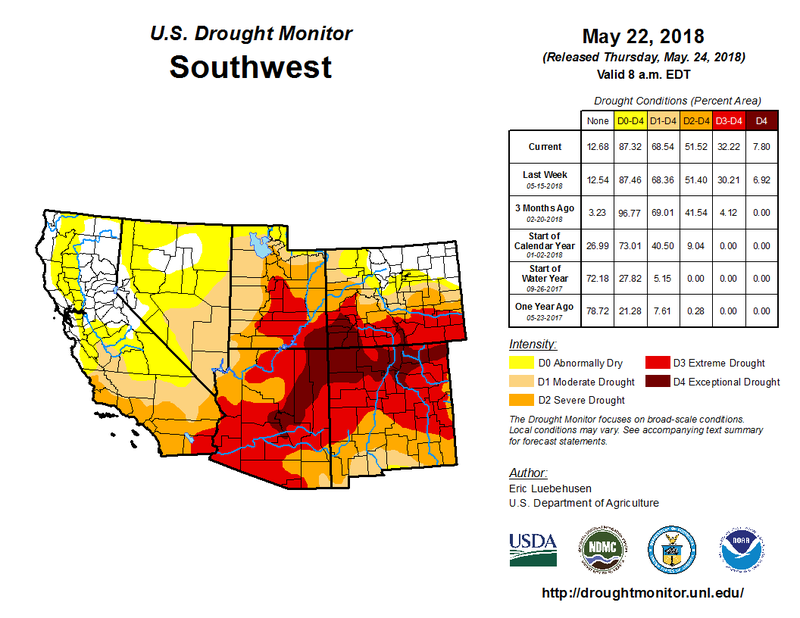 The drought has gotten so bad in southern Colorado that several counties have been declared disaster zones by the United States Department of Agriculture, making those areas eligible for emergency financial assistance. Conditions in the San Juan Mountains of southwest Colorado are at the highest level of drought, according to the United States’ official drought monitor. The drought in the south began with an absolutely horrendous winter. Purgatory Ski Resort, near Durango in the San Juans, saw only 125 inches of snow this season, less than half of the 260 inches it averages. Telluride saw only 171 inches in the 2017-’18 winter, also only about half of the 309 inches it normally sees in a full winter. A bit further north, Crested Butte only saw 145 inches compared to the 300 inches or so it typically sees in a winter. Particularly for the hardest hit areas of southern Colorado, half of the snow means half of the spring snowmelt. A quick scan through statewide stream flow levels already shows below average water discharge through most of Colorado (there are localized exceptions), thanks to a warm May that’s already melted off much of the meager snowpack. What does this all mean? For starters, camping season is already feeling the pinch of burn bans for much of the southern half of the state. Barring big summer rains, these are unlikely to be lifted anytime soon. The biggest concern will be the possibility for wildfires this summer. We’ve written extensively about the looming danger of a dry winter and how that can help fuel a nasty summer. With a quick melt and the snow water tap already running dry in much of the state, we’ll need steady rain to keep the ground moist enough to avoid fires. Heat waves, such as the horrific 2012 one that helped start the Waldo Canyon Fire, and gusty, dry winds can set the stage for dangerous fire conditions. Conditions are even nastier in southern Utah, Arizona and New Mexico. Flagstaff, Arizona, saw one of its worst winters on record, picking up just 38 inches of snow for the season, a fraction of the 101.7 inches it averages. Taos Ski Area in New Mexico saw 78 inches of snow, significantly less than the 300 inches it would see in an average year. Albuquerque already has water restrictions in place this summer. Recent rains have helped in the Denver area and northern parts of the state. Year-to-date precipitation in Denver is around three-quarters of an inch below average, which is a deficit, but not a huge one. 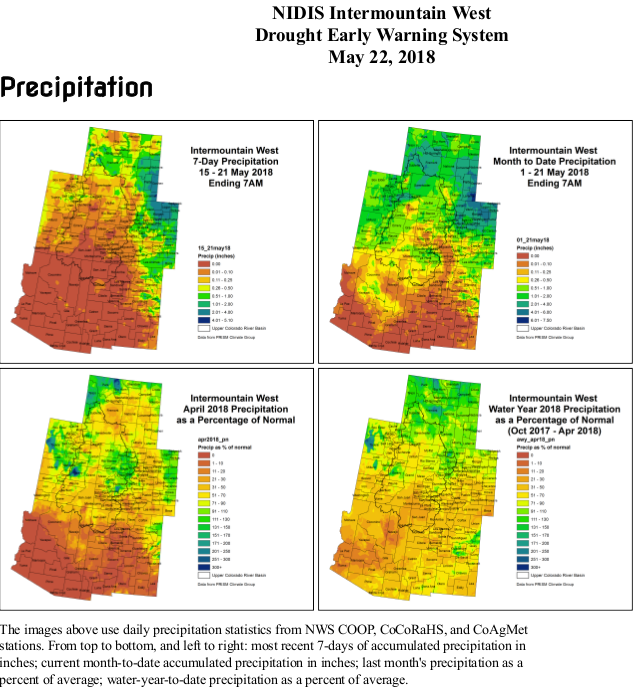 On the eastern plains, Akron has seen more than double its typical May rainfall, helping ease some of the worst drought conditions in Colorado’s breadbasket. Reservoir levels are above average, and a wet June could help ease drought conditions. 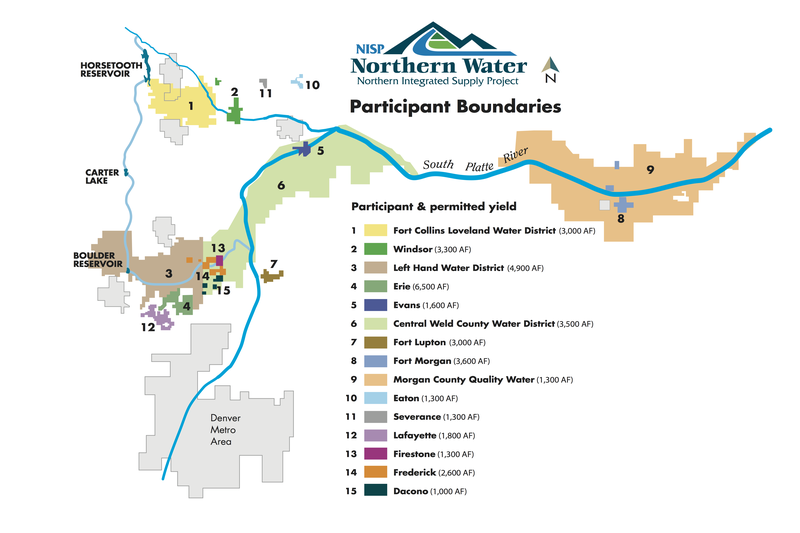 Northern Integrated Supply Project July 27, 2016 via Northern Water. The council voted 5-2 to allow city staff to negotiate, with Councilmembers Ross Cunniff and Bob Overbeck against, and those in agreement largely arguing it couldn’t hurt anything. City staff would need to go to council to approve any final deals. “We need to be in the game and to negotiate and look out for Fort Collins’ best interests,” Mayor Wade Troxell said. The agreement to negotiate doesn’t affect the city council’s overall negative disposition toward the Northern Integrated Supply Project. NISP would lead to the creation of two reservoirs, the Glade to the northwest of the city and the Galeton near Greeley. It would divert nearly 40,000 acre feet of water from the Poudre River. Fort Collins Water Resources Engineer Adam Jokerst noted for comparison that the city typically treats about 25,000 acre feet of water a year, about half of which is from the Poudre. That lead attorney, Margaret “Meg” Parish, first assistant attorney general in the Natural Resources & Environment Section, wrote at least two scathing letters to the EPA and the Department of Justice (DOJ) in recent months, calling the EPA’s action “shocking and extraordinary” and expressing “deep concern and disappointment” that the agency unilaterally reopened settlement talks without consulting co-plaintiffs. Besides the Colorado Department of Public Health and Environment (CDPHE), those include Pueblo County and the Lower Arkansas Valley Water Conservancy District. The move was particularly alarming, she noted, because the state and EPA signed an agreement not to communicate with the city without the presence of the other. 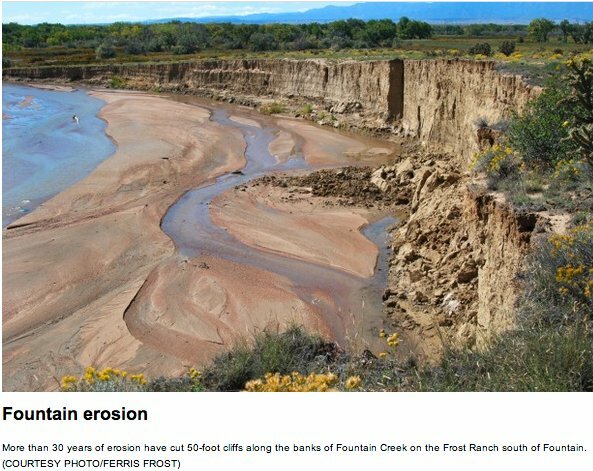 EPA’s reopening of negotiations has sown suspicion among co-plaintiffs who already distrust the city due to sewage discharges, raging stormwater flows and sediment in Fountain Creek that befoul the creek, threaten levees and block irrigation headgates interfering with raising crops. The possibility of a settlement was suggested to voters last fall when Mayor John Suthers campaigned for passage of stormwater fees, saying their adoption would help the city end the lawsuit, filed by the EPA and CDPHE in November 2016 after the city flunked compliance inspections in 2013 and 2015 for its MS4 permit (Municipal Separate Storm Sewer System). The lawsuit alleges ongoing violations of the Clean Water Act, saying the city failed to force developers to install proper storm drainage infrastructure, gave waivers to others and didn’t adequately inspect and monitor its waterways. The city spent only $1.6 million a year on those tasks from 2011 to 2014, a pittance considering the city’s drainage needs are estimated at $1 billion. Approved by voters in November, the fees go into effect July 1 and replace general fund money used to satisfy an April 2016 deal the city made with Pueblo County to spend $460 million over 20 years on stormwater. The agreement grew from Pueblo County’s demands after the city adopted stormwater fees in 2007 and abolished them in 2009 and came as the city activated its $825-million water pipeline from Pueblo Reservoir.